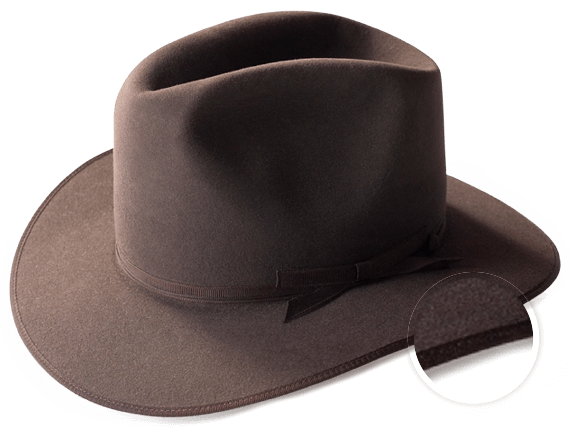 This is RM’s hat of choice, and modelled on the classic Stetson ‘Open Road’, made under licence by Akubra and sold as the ‘Campdraft’, now made especially for R.M.Williams and named the RM. It has a classic coachman’s cord around the crown to attach the hat in high wind, and a tall crown with a three-inch brim. It’s a stylish hat with a satin band, satin lining and made from imperial quality fur felt – but it’s not flashy. With one of these on your head, you’re unlikely to stand accused of being all hat and no cattle. Made in Australia. We use a high quality fur felt, woven in Australia to ensure the best fit and finish. Comfort is just as important as function, that’s why our R.M. Akubra comes lined with soft silk and a Petersham hat band. The trim of our RM Akubra is finished with a bound edge hand sewn to help keep the shape of the hat. Based on a classic 1963 design which emulates the heritage, tradition and history of R.M.Williams.